Heineken’s pub business, Star Pubs & Bars, is to invest £2.5m in 11 pub refurbishment schemes in the North East. The work, which follows on from the £1.2m the company has already spent on establishments in the region so far this year, forms part of a £30m national initiative designed to help the pubs improve their food offering. By 2020, Star wants 50% of its sales to come from food. Among the sites earmarked for investment are The Spread Eagle and The Staith House in North Shields; The Ship Inn in Monkseaton; Fleet Street and The Waterline in Newcastle; The Kittiwake in Whitley Bay; The Fellsider in Whickham; The Golden Lion in Corbridge; The Red Kite in Winlaton Mill and The Sun Inn in Morpeth. Wherever possible and appropriate, the pubs will be upgraded to provide flexible spaces for multiple occasions. Wi-fi and coffee will also be offered to broaden the appeal of the venues, the lessees of which are investing a further £250,000. Star Pubs & Bars trading director Chris Jowsey said: “This investment is a reflection of the continued confidence we have in our pubs and our operators. “Lessees are seeing returns on investment of over 31% on capex projects and their demand for and our commitment to invest in them is evidence of confidence on both sides in the pub market and the economy as a whole. “Investment in creating pubs that people want to visit whatever the occasion is critical to their long term sustainability and the communities they serve. “Food is an increasingly important part of the mix and an area we want to help our lessees to develop. 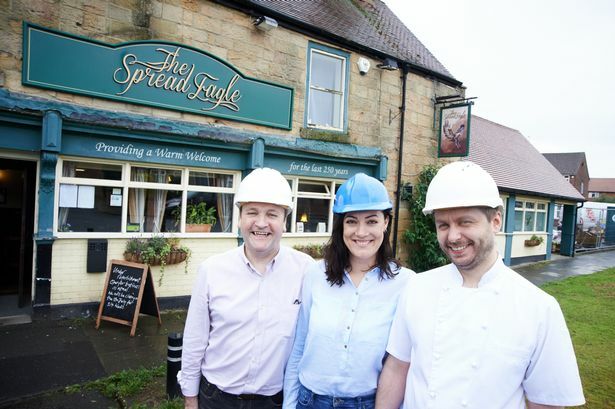 Work has already begun at The Spread Eagle in Preston Village, North Shields, which will be closed until early August as the pub undergoes a £195,000 internal and external refit to increase dining capacity and upgrade the décor and facilities. Traditional materials such as flagstones and wooden panelling are being used and an open fire will be installed to retain the pub’s character. A new orangery is also being added, doubling the pub’s dining area, while a larger kitchen will enable it to serve an extensive menu of locally sourced food. The refurbishment, which will create six jobs, will also see the outside of the pub receiving a complete makeover with the addition of a new patio and landscaping. Six jobs at the pub are being created as a result of the refurbishment. Lessee Claire Hall, who has taken on the pub with her husband David and father, David Smith, said: “It was going to taster nights at The Staith House that made us realise we could serve restaurant quality food in pub and when the Spread Eagle became available we leapt at the chance to take it on. “We’ve already begun to build a reputation for food, drink and service and have a keen following of people who come in every day to see what ales are on as they know they are well cared for. Heineken is the UK’s leading cider and beer producer and, through Star Pubs & Bars, operates 1,050 establishments.